Be the life (or death!) 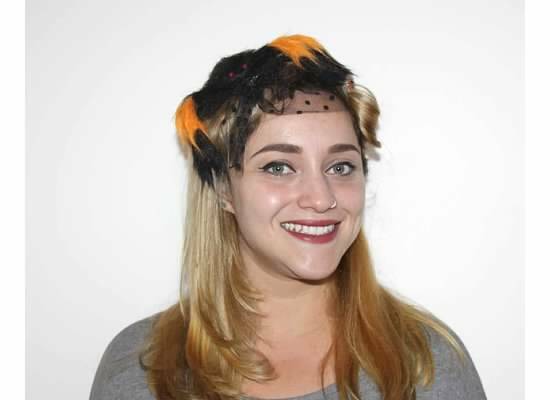 of the party with our DIY Halloween hairstyle guide. 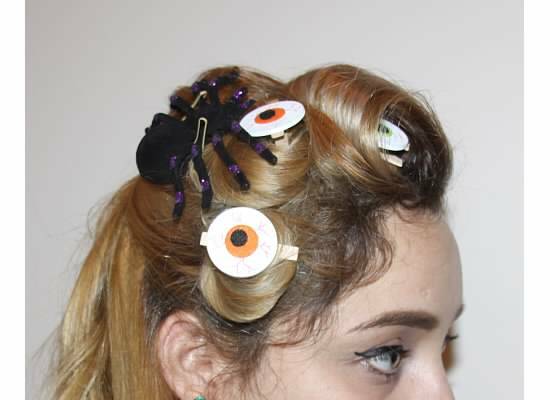 You don’t have to be a hairstylist or Professional Pinterester to put together some prize-worthy looks this Halloween. If you’re even just a little bit crafty, you can pull off these styles. C’mon, don’t be afraid. 1. 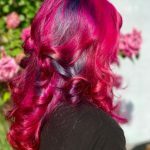 Medusa ‘do. Any creative twisted up-do will do. I added a rubber snake and a tooby loop. 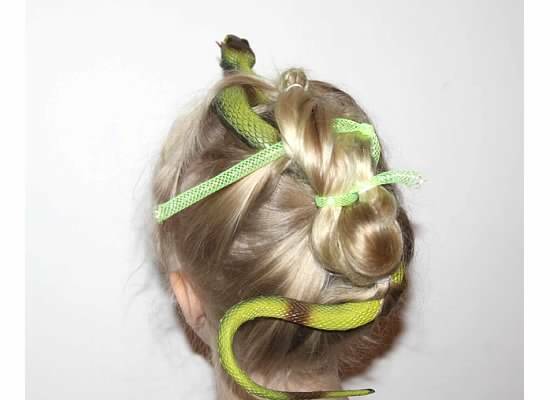 Tip: I found that the snakes were heavier than I thought, so if you have thin hair, go with less snakes. 2. Pumpkin head. At the 99 Cents Only Store, I bought a hair donut and a can of orange hair spray. I had some green felt leftover from a previous project, but you can buy felt squares at Michael’s for about a quarter. 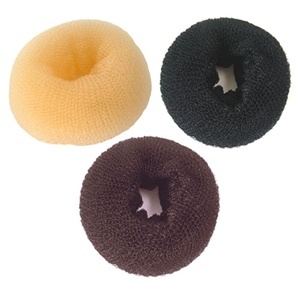 The hair donut is suprisingly easy to use – simply scoop your hair around the donut (you must have long-ish hair). 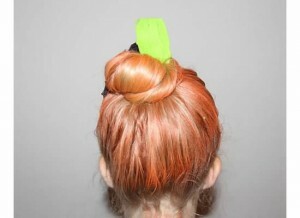 Then spray the hair orange and add a green felt “stem” with a bobby pin. You can also just spray the donut and not the whole head of hair. 3. 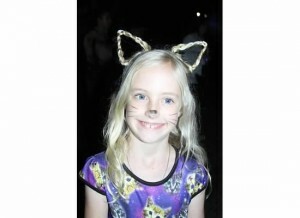 Braided kitty ears. 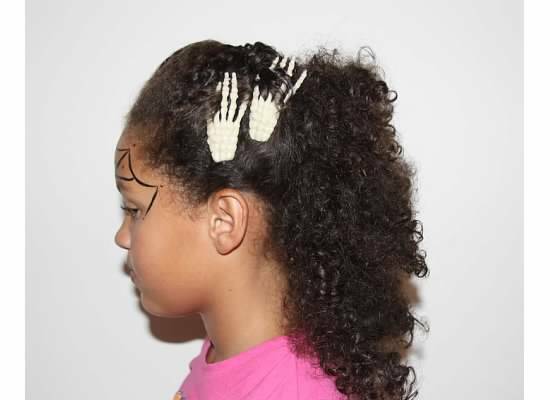 What you need: pipecleaners and bobby pins. This look is super-cute on kids, teens and adults. You can find the tutorial in this YouTube video. 4. Spiderweb…with spider! 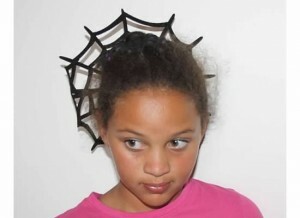 I bought the black felt web at Michael’s, but have since seen similar at the 99 Cents Only Store. 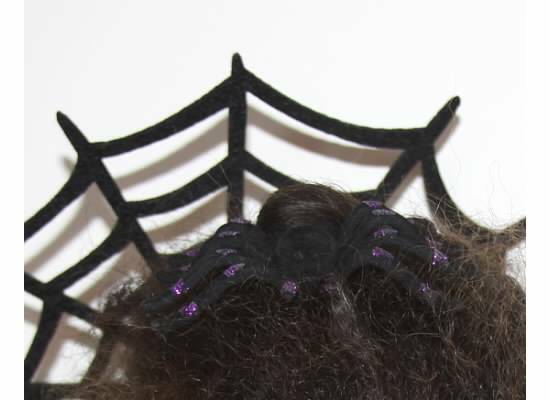 I pinned it on in the back and added a fuzzy-legged spider (shudder!) on top. Creepy! 5. Pumpkin hair clippie. I bought a clip just like this from a boutique bow vendor. But if you’re so inclined, you can make one yourself. 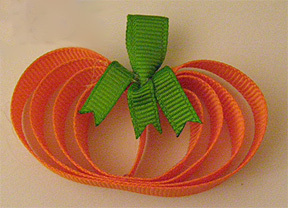 All you need is orange ribbon, green ribbon and some glue. 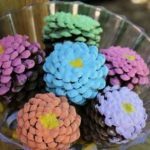 And a tutorial like this one I found from the Girl Things blog. Stylin’! 6. 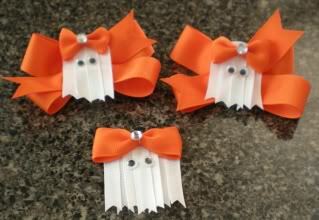 Ghost hair clippies. These are just bootiful! And not too difficult to make, either. 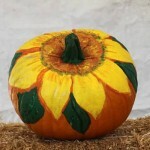 Just follow this tutorial from The Crafty Charlestonian. 7. The eyes have it! I bought these cute eyeball closepin clippies at Michael’s for about $2. They make for eye-catching accessories and couldn’t be easier to use! You could also make some with bobby pins, construction paper, and glue. 8. Tarantula! This fuzzy, bendable hairy-legged tarantula was about $3 at Michael’s. 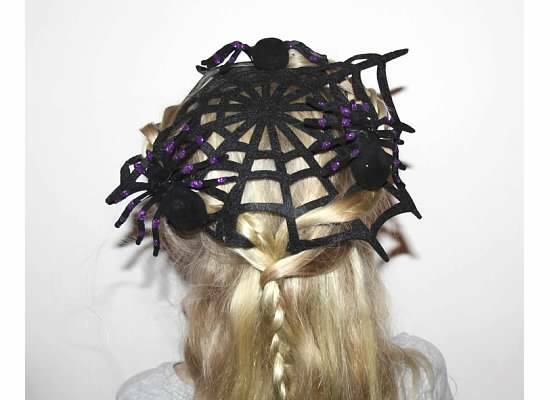 It can bend around a hair bun or sit comfortably atop your head as a spine-chilling accessory. A few bobby pins hold it in place. Note: If you have dark hair, only the orange in the legs will show up! I am getting the creepy-crawlies just looking at this! 9. 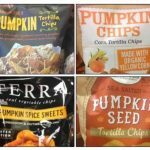 Pumpkin Monster! 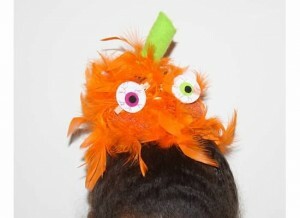 For sheer silliness, this look was achieved with a hair donut, an orange feather boa wrapped around it, green felt for the “stem” and clip-on eyeballs from Michael’s (optional). 10. 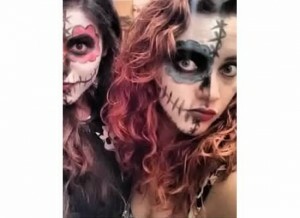 Skeleton hands. These boney hands are made by Wilton and are designed to stick out of baking cups. $1.99 for a pack of six. But they really “grab” your attention when you weave them into your Halloween ‘do! 11. Web of lies. You’ll catch stares of approval (in addition to flies) when you pin this felt web (Michael’s again) on your head. Attach a few flocked spiders (from the 99 Cents Only Store) with bobby pins for that extra touch. Then head off to the funeral – er, party – in style! With a little creativity…and some face paint, you, too can look like a Day of the Dead skeleton. 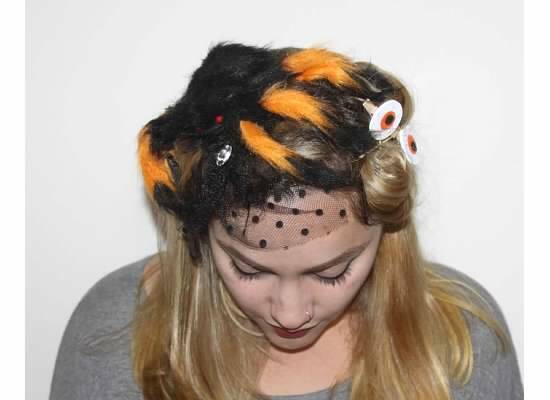 What wild and crazy things are you planning to do with your hair or make-up this Halloween? Coupons: Lipton, Tampax and More!